Derive the equation for the vertical acceleration of a rocket. See the solution video for the derivation. This is College Physics Answers with Shaun Dychko. Our goal is to show that the acceleration of the rocket is the velocity of the exhaust divided by the mass of the rocket, times the amount of gas that is expelled, the mass of it anyhow, and then divided by the delta t, the time it takes to expel that gas, and then minus the acceleration due to gravity. So, a free body diagram of the rocket shows a thrust force upwards and gravity down and this net force which is the up forces minus the down forces, is thrust minus gravity and that will be mass times acceleration from Newton's Second Law. 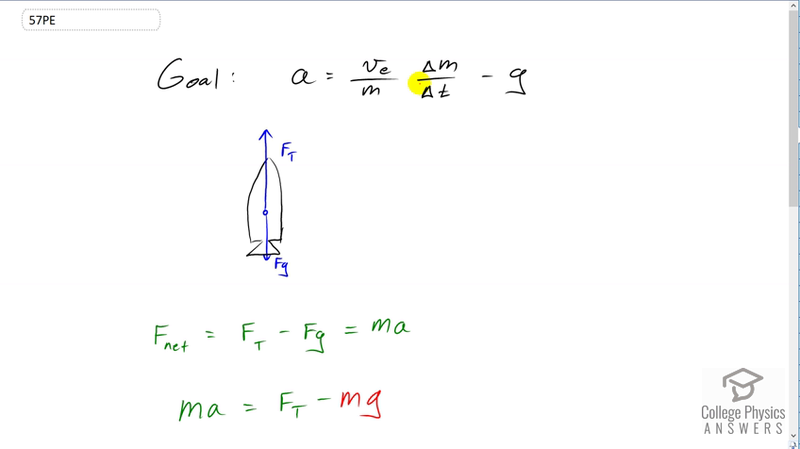 We'll rearrange this to put m a on the left and we have F t minus m g where I substituted mg in place of the force of gravity, then divide both sides by m and you get this part here, acceleration is thrust force divided by mass of the rocket minus g. This already looks similar to our goal. The only thing we're missing is this part. So then we think about the thrust force. The thrust force will be the change in momentum of the gas divided by time. This is basically Newton's Second Law expressed in terms of momentum instead of acceleration and mass. That will be the mass of the exhaust times its final velocity, minus the mass of the exhaust times its initial velocity, that's its change in momentum, and we divide that by time. The initial velocity of the exhaust is zero because it's at rest inside the rocket initially and then it's burned and then it shoots out with some final velocity. So this thrust force is mass of the exhaust times the velocity that it comes out of the rocket at, divided by time. Now the mass of exhaust that's expelled is the change in mass of the rocket. So we'll substitute delta m in place of m e here and so the thrust force is delta m v e over delta t which we can then substitute into our acceleration formula. Then we have acceleration is v e times delta m, just switching the order of these factors around so that it looks similar to our goal at the top, divided by m delta t minus g.